I often define my acceptance through the compliments and praise I receive. When I feel admired and complimented it helps me feel wanted. When I feel undervalued and overlooked it causes me to look within and wonder what’s wrong with me. What have I done that I’m not receiving praise like others around me? I have found that I seek approval most often in my performance. When my hard work goes unnoticed and someone else gets the praise, it leaves me feeling undeserving and invisible. I often catch myself comparing my performance with others who seem to get more praise. I define my worth on the compliments and praise I receive, or the lack thereof. I find my worth in what has been said about me and even in words that have never been uttered. I allow my attitude to become so reflective of the way others treat me and it stems into the way I view myself. 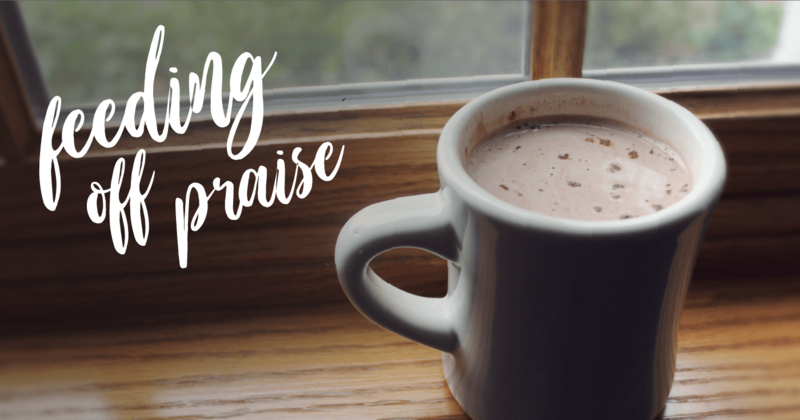 Praise and admiration from others is something we all need, but it shouldn’t ever become something we crave. We shouldn’t be empowered solely by other’s approval that we let it consume our thoughts. We live in a society that craves acceptance and approval. We desire to get the most reactions, likes, shares, etc. and often forget to focus on the only One whom we should be serving. We don’t have to constantly rise to the top and check off all the boxes of perfection to be highly admired in God’s eyes. God doesn’t have expectations for us like the world does. He only asks that we love others and serve Him with our heart. Being the introvert I am, it takes effort to speak up. If I finally find the courage to speak, I quickly find that I’m drowned out by the loud rambles of others chatting away while my quiet thoughts go unnoticed. In times like these it becomes ever so difficult to muster up any love left within my heart to display to others. I find myself clenching my fists in displaying gratitude or encouragement when I’m not given the same treatment in return. When I’m feeling overlooked and this world leaves me feeling invisible and unacknowledged I let it take root in my heart. I let it steal my joy and grow into bitterness. Jealousy. Discontentment. Frustration. I see others receiving attention while my effort and intentions seem to be invisible to the rest of the world. I allow the screaming perceptions of society and the belittling silence of neglect to dictate my worth. Both of which are ideas and assumptions, not firm truths that God has provided me with. The main source behind all of this negative thinking stems down to one source – Satan. I can’t count the times that I have become so engulfed into negative thinking and forgotten who is the primary instigator behind my doubts, insecurities and anxiety. I’ve allowed Satan to pull me so deep into discouragement and anger, that I’ve lost sight of God’s purpose for what I’m experiencing. I get so caught up in desiring to feel accepted, admired and acknowledged that I lose sight of what really matters. I truly believe that Satan is using the very things that I struggle in the most to be consistently infiltrated into every aspect of my life with purposeful strategy. He threads in lies of deception that correlate with the areas I struggle with the most which causes me to stumble without realizing the source of deceit. Growing up I often found myself in the corner of the room, feeling ever so invisible to the world. I was the reject that nobody wanted as their friend. Being quiet and reserved I didn’t feel qualified to open up and share myself with others. I stuffed all the deep feelings of hurt and rejection inside so nobody could see how broken I was underneath the surface. I tried to show love, compassion and care for those who called me their “friend,” but I didn’t feel that same love in return. Time did allow some of those deep scars of the past to heal, although I have often found those same emotions emerging into areas in my daily life today. Thoughts and memories quickly flood over me like it was yesterday, haunting me that I’ll never overcome the past. As time goes by those memories compile, causing those negative thoughts from my past to be reinforced into lies that are impressed upon my heart. It’s like my heart was permanently stamped with the lies of my past that endlessly entrap and hamper me from who I desire to become. Satan likes to dig deep into our past and select things that he knows has caused us affliction in the past. Like me, I know Satan too is targeting you in areas that he knows he can defeat you in. We all have felt overlooked and unaccepted. Satan likes to use the very things we rely on the most for happiness to cause us to get tripped up and messed up. He will use anything that will hinder us in our relationship with God and displaying His light to the world. Amidst dealing with the frustrations people pleasing brings I have to remind myself of this truth. I’m not living to please others. I’m living to display God’s love to them. I don’t have to be accepted by them. They don’t have to like me. I’m not here to be admired, liked or loved by the world. I’m not defined by their opinion of me. Their perception of me isn’t truth. My mistakes don’t determine my worth. Jesus was rejected and despised, but that never defined who He was. It defined those who were treating Him wrongly. When we display love to others and treat them how we would be treated, it displays what is within our heart. If you find yourself craving for admiration, approval, praise or appreciation, you are probably looking in the wrong place. We never need to search for scraps of acceptance because we are fully accepted by the only One who truly matters. We can take that weight off of trying to please everyone, because it is humanly impossible. We weren’t made to live up to the expectations of everyone and cause it to inhibit us from who God created us to be. God never intended the thoughts of others to be so dominating that it overtakes our joy and self-worth. He provided us with His promises that He would always love and accept us so we wouldn’t have to run to the approval of this world. When you feel like Satan is pulling you down a road of despair and you feel neglected by others, remember you don’t need to be defined by how you are treated, but rather how you act, react and treat others during difficult circumstances displays your true character. You can’t control how others treat you, that is up to them, but you can control how you react. Choose to let go of the lie that praise defines your worth. Rest in the firm truth that God’s love for you is all that matters and He knows your heart, even when others fail to see you, respect you, choose you, admire you or appreciate your effort. God sees and it will all be made right in time. What matters is the intentions of your heart and how you react when difficult situations arise. Choose to show your light to others despite how you are treated. Take all the mistreatment and injustice and let it be released into God’s hands for Him to seek justice. He’s got it and is taking care of it. Go and be the example of Christ that you long to see in others. Whatever you do, work at it with all your heart, as working for the Lord, not for human masters, since you know that you will receive an inheritance from the Lord as a reward. It is the Lord Christ you are serving. Anyone who does wrong will be repaid for their wrongs, and there is no favoritism.